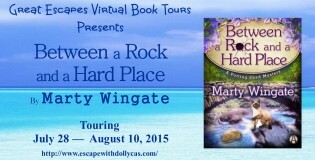 I just read an amazing book recently, y'all — Between a Rock and a Hard Place by Marty Wingate. Let me tell you a little about it. 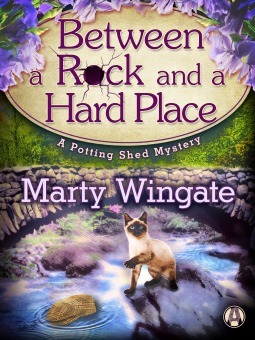 Between a Rock and a Hard Place is the third book in a great cozy mystery series, the Potting Shed Mysteries. Before beginning Between a Rock and a Hard Place, I took the time to read the first two books in the series — The Garden Plot and The Red Book of Primrose House — and I'm very glad I did. Not only are those books enjoyable great reads on their own, they gave me deep background into Pru, Christopher, and the other recurring characters — background that I wouldn't know otherwise. Between a Rock and a Hard Place can be read as a standalone, and you'll be able to follow the plot just fine. If you like to really be in the know (about badgers, for instance), you'll want to begin at the the beginning. I rated each Potting Shed Mystery five stars. The second and third books are better than the one(s) before it! Here is a wee bit of Pru's back-story: Pru (aka Prunella) Parke was born and raised as an only child in Texas, to a Texan WWII veteran and his English war bride, themselves only children too. Pru's daddy taught her important things such as how to fix biscuits (American biscuits, not English cookies), and how to refer to the preparation of food items as "fixing" them. Pru's mum brought her up as a proper Englishwoman — telling Pru stories of her childhood in England, and having Afternoon Tea. 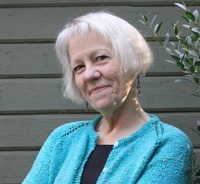 When Pru was in her early 50s, she was "orphaned" after her mother passes away. Since she has no family remaining in Texas, has dual citizenship, and heard so much about England all her life from her mum, Pru decided to move to England. The action of The Garden Plot takes place during the year following her move. The Red Book of Primrose House takes up where The Garden Plot leaves off. Between a Rock and a Hard Place directly follows The Red Book of Primrose House. Between a Rock and a Hard Place is a really fun read with a really good murder mystery. Plus there's a catnap, a great ending, and a wedding! Who doesn't love a wedding? I always cry at weddings — even fictional ones. How about you? The fourth book in the series, The Skeleton Garden: A Potting Shed Mystery , is available for pre-order from Amazon and will be released on March 8, 2016. I'll be anxiously awaiting it. Stay tuned to Marty's website and Amazon for the Cover Reveal! I can't say enough good things about Author Marty Wingate's Potting Shed Mysteries, especially Between a Rock and a Hard Place, her best one yet! (I also have to take care not to say too much, and reveal spoilers.) But take my word for it, y'all, Between a Rock and a Hard Place is a winner. Especially if you're a gardener, or a vicarious gardener (that's me! ), you'll love this book (and the series) with the unique story lines, wonderful characters, and marvelous settings! I highly recommend Between a Rock and a Hard Place, and bestow upon it our highest rating of Five Kitties. Note: I received a complimentary copy of Between a Rock and a Hard Place in exchange for my honest review. All opinions shared are 100% my own.